Their names were Edmund Hillary and Tenzing Norgay and the roof of the world was Everest. This is the breathtaking story of how two very different yet equally determined men battled frost-biting temperatures, tumbling ice rocks, powerful winds and death-defying ridges to climb the world's highest mountain. 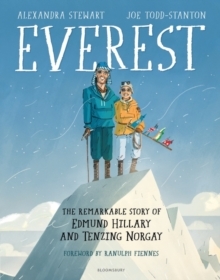 Join these two unlikely heroes on the most amazing of adventures and discover the impact of hundreds of men and women that helped Hillary and Tenzing achieve their goal. But triumphs can be marred with tragedy as not everyone who climbs Everest survives ... With a beautiful foreword by the greatest living explorer of our time, Sir Ranulph Fiennes, this brilliant book combines fresh and contemporary illustrations by Joe Todd-Stanton with Alexandra Stewart's captivating writing and publishes in time to celebrate the centenary of Edmund Hillary's birth. This unique narrative tells the story of how Edmund Hillary and Tenzing Norgay made their mark on the world from birth right up to their final days and the impact they've had on Nepal today.